The Sutton Hoo ship burial and the dark ages artefacts found there have fascinated many of us from first sight. The full face helmet alone is an amazing object in its own right. The other treasures create an impression of wealth not normally associated with the popular idea of the Anglo-Saxons in the dark ages. The recent redisplay of the Sutton Hoo discoveries at the British Museum shows the objects familiar to frequent visitors in a new setting and with new interpretation. What I liked most about the redisplay was the context given to the finds. The display case is long and tall with the outline of a ship in white. The photo shows this is faint but helps remind visitors that the objects come from a ship grave. This is underlined by the simple labels showing whereabouts in the ship the objects were found. A big change in this display is the number of modern recreations of objects displayed alongside the originals. I liked this approach because it helps the non-specialist understand what the original looked like and can help see how it was used. For example the modern versions of the cauldron and chain make it clear the size of the object and it’s use. Not least the length of the chain shows it was hung from a high support. I also liked the way the modern versions were clearly marked to avoid confusion. Inevitably the modern helmet attracted most attention while I was in the gallery. Having it displayed by the original allows a compare and contrast the two. Plus it shows how much the Anglo-Saxons liked to create an impression with polished metal objects. The reconstructed helmet has more detailed interpretation than I expected. It highlights the pagan horned dancing figures similar to other pagan depictions. It also points out the similarity to Roman cavalry tombstones that show a Roman (or auxiliary) riding down a barbarian. The shield was a reconstruction to provide a display for the original shield fittings and this is essentially unchanged. It has a modern and an original sword below it. Seeing the modern sword in pristine condition helps the visitor imagine the impact visually and physically of this finely made weapons. What does this splendid display tell us about the Anglo-Saxons and their world? It makes clear the wealth that an individual could command. From gold metalwork and red garnet fittings on the pouch cover to the workmanship of the helmet’s decorated panel and ridge it shows the love of bling and display. Identifying where objects come from gives an insight into the wider world of the time. Clear links between East Anglia and East Sweden are seen along with silver plate from the Mediterranean (more dark ages bling!). The discovery is significant enough to feature in the name of Room 41 at the British Museum. Room 41 is now the Sutton Hoo and Europe, AD 300-1100 gallery. This 2016 exhibition is spread over two floors of the Photographers’ Gallery in London. My interest in Donovan’s work comes from his taking fashion out of the studio and into his East End. That’s not to say there isn’t plenty of conventional fashion shots in the exhibition. The exhibition includes studio, outdoor work, portraits and video. Something that really comes out is how Donovan was very much a man of his time whether commissions from Town magazine, photographing a young Julie Christie, musicians’ portraits in the 1990s or directing pop videos. Seeing his studio day bookss give a reminder that he was earning a living from his work. The more bread and butter commissions recorded for Woman’s Own are a good example of this. One of a trio of working class photographers in the 1960s Donovan does stand out (David Bailey and Brian Duffy were the other two). I see him as different because he used photojournalism techniques with fashion. Whether on East End streets, power stations or shooting through a car window he took fashion photography out of the studio and safe landscape. This technique is maybe taken too far though in his Spy series of photographs for Town magazine. Or perhaps time simply has made them lose the innovative look they had when published. There’s an exhibition catalogue for anyone who missed the show. Like most people who’ve encountered O’Keeffe’s art its the flowers and sound based abstracts that stick in the mind. So it was great to see such a broad cross section of all her work from the bones to early charcoal work. 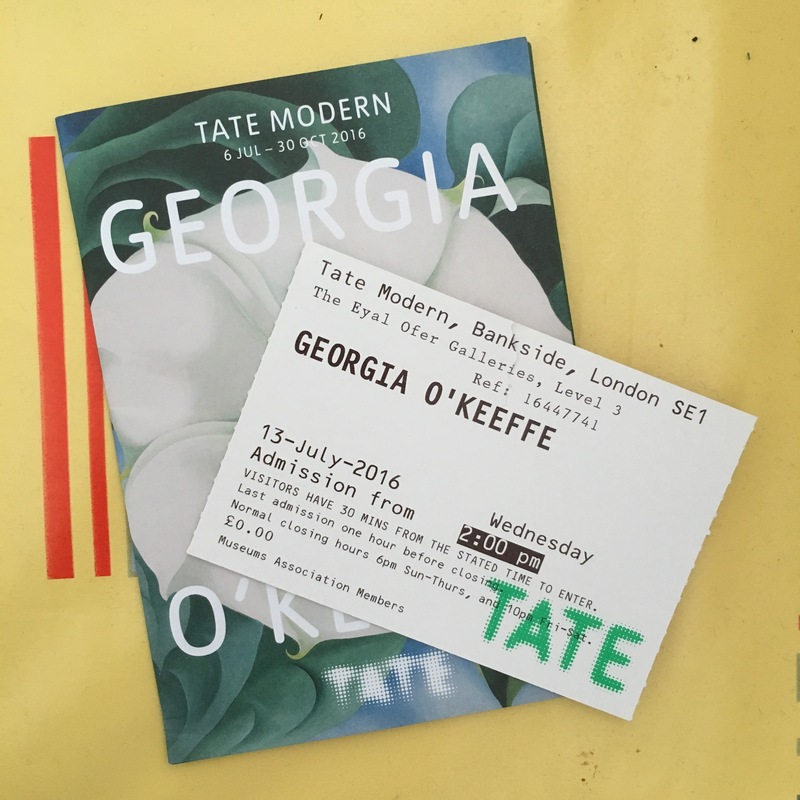 And a visit to Tate Modern is always enjoyable. In particular the New York landscapes were new to me and I liked the mix of views and times of day used. Having lived in a tower block in a city the high viewpoint of the city at night really struck a chord. Alfred Stieglitz’s photographs featured throughout the exhibition. This included personal photos, landscapes, the well known images of O’Keeffe. The photos added context to O’Keeffe’s life and works but also her relationship with someone who had a creative life in their own right. Seeing Stieglitz’s photos with O’Keeffe’s painting of the same viewpoint was really interesting. Not least because he used daylight whereas she had painted a night scene. There was little in the way of ephemera in the exhibition but books and copies of Stieglitz’s journal Camera Club were on view. Also exhibited were some examples of his series of cloudscapes from the Equivalent series. Better known now is Ansel Adams and his work appeared too. He travelled with O’Keeffe and shared a love of landscapes. I found it interesting seeing his large, very clear and more contemporary looking images compared to some of Stieglitz’s smaller and darker prints. I’ve visited the Imperial War Museum (IWM) more times than I can remember. It was a favourite day out with my father in the 1960s and 70s. So a new improved version was a must see. Overall I really liked the new look and interpretation. Not least because some of the old favourites are still there – including the flying bombs of the sort that fell at the end of my mother’s street in the Second World War! What’s changed at the IWM then? A general feeling of more space with more coherency combined with a diversity of objects. For example the Cold War display has an artist’s response to the threat of nuclear destruction. I liked the way there’s a map of each display with interpretation backed up with individual labels. The introduction sets the scene and the map orientates you. Talking of the labels they are stuck on cases which makes their connection with the object clear. From what I saw some are beginning to suffer wear from visitors testing how well stuck they are. I also felt some of them lacked contrast making reading harder. Having uncles who served in Bomber Command I enjoyed seeing the Lancaster cockpit on display. It seemed huge but had to fit most of the crew in. The current secret service exhibition is fascinating in its own right and the coding and decryption section rang a bell with another uncle’s postwar service. I also visited the Holocaust Gallery. Seeing it for a second time I spent more time absorbing the exhibits than being stunned by the enormity of what it depicted. The inclusion of all groups attacked by the Nazis shows just how many people were affected by these political and ethnic policies. The section with a diagram showing how all branches of the government were part of the annihilation was particularly chilling. On a personal note I found the items and film from the liberation of Belsen interesting. This was because my father was amongst the troops rushed there to try and resolve the chaos left when the Nazis abandoned the camp. Ok, I’ll admit it: I was dreading another recreation of a mid war trench. Much to my relief this exhibition is impressively inclusive. Both in terms of covering all the war chronologically and in looking at all fronts. This included the home front and I found lots of interesting objects and interpretation. I definitely left feeling I learnt something! The variety of uniforms was impressive as it included all periods and most fronts. Even some Balkan States uniforms are there. The early war German did look a bit like he had Ugg boots instead of natural leather marching boots! What I really liked was the mannequins for the uniforms are fairly abstract black shapes. This gave an anonymity to the uniform displays which made me think of all the unknown soldiers. Naturally being a museo myself I had to look at things from a work point of view. I found all the staff really friendly and knowledgeable and happy to talk about the redisplay. I also was interested in how the IWM has brought print on demand into their shops. Again the staff were pleasant and helpful when I asked about this. Was it all brilliant then? Well, it was pretty much ten out of ten. I think seeing familiar objects alongside recent acquisitions was one of the strengths. That continuity made me feel long time visitors were valued by the redevelopment team. The thoughtful attention to detail is a nice touch. For example using odd spaces in the upper main hall to display odd objects. This was a bit like museum Easter eggs! Yes, I did try the cafe which is fine and the staff are friendly.